and not in cold, grey Seattle. 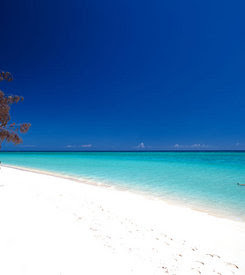 This is Heron Island, in Queensland Australia. This morning I was leafing through our copy of 1,000 Places to See Before You Die and the descriptions of clear waters, beautiful beaches, amazing diving and migrating whales made me wish that I was...well...there. Australia and New Zealand are high on our list of places to travel. Hopefully it'll happen. Someday. The warmest water I ever put my feet into was the Coral Sea right off Port Douglas, which is just north of Cairns AUS. Lovely water. Need to get back to NZ too. I'm jealous! I would love to go there. Someday, hopefully!